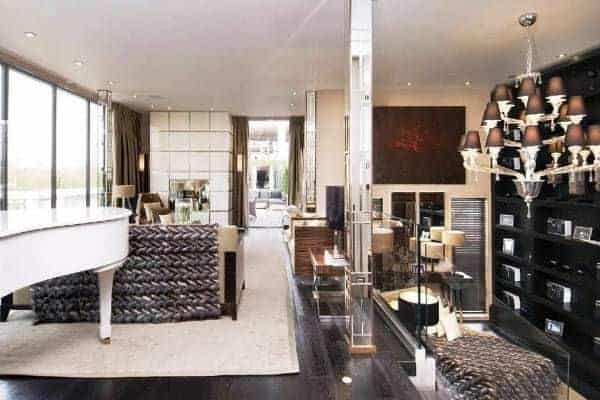 Overlooking Hyde Park and situated at is south-western corner, this unbelievable luxury penthouse apartment in Knightsbridge is the ultimate space to rent in London. It is an expansive property is 800 sq. m and beautifully designed throughout with bespoke interiors and fittings. Direct lift access to the penthouse opens to a private landing, with Art Deco detailing, and soon as you step inside you realise what a magnificent property this is. 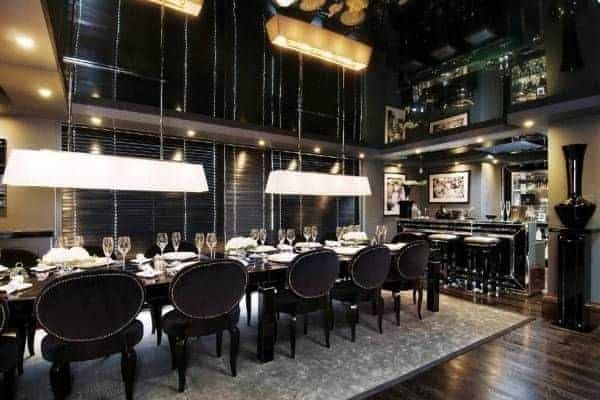 Its huge entrance and a spectacular dining room immediately submerges you into a luxurious atmosphere of solid, dark American oak flooring, black gloss stretch ceilings, built-in Italian bespoke black-glass mirrored bar and contemporary furnishings. The walls are clad with high gloss wood panelling and a set of splendid, bespoke, double walnut burr doors which lead into a grand and dramatic 3 m-high ceiling reception room, which has a white baby grand piano, a floor-to-ceiling custom-built feature bookcase and windows all around providing fabulous Park views. We particularly like the touch of eccentricity to the apartment’s décor, combining and made of elements from Italy, America, Zimbabwe and Madagascar, as well as its provision of six outside spaces. These include a beautiful outside living area decorated with wall mirrors, contemporary chocolate brown woven lounge seating and dark-stained timber decking, and feature fireplace. You will be able to relax in total comfort al fresco as you enjoy the extraordinarily uninterrupted views from this apartment. This luxury apartment occupies the 6th floor of a historical building and can accommodate up to 12 guests in 6 elegant en suite bedrooms, each having a unique style. In this apartment you can enjoy relaxing in rooms blending a stylish panache of luxury leather, glass and wood. Your wellbeing and health is a main part of the apartment’s design and provision ethos, and you are provided with a hydrotherapy Jacuzzi, fitness room and state-of-the-art gym equipment, a Kinesis Personal Trainer and custom-built massage room. 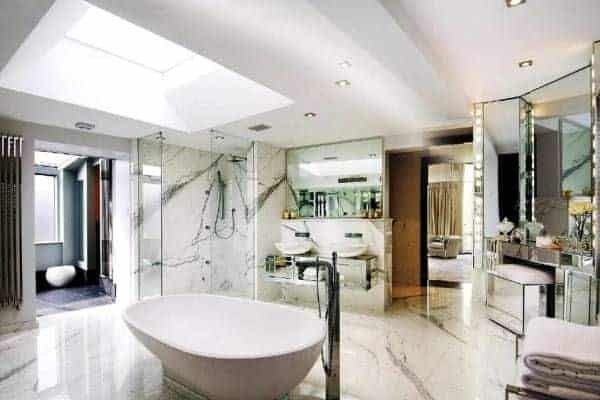 Situated in an exceptional central area of the one of the World’s most glamorous cities, this luxurious apartment is ideal for a group of friends and their guests, who wish to stay in a truly deluxe treat in London. From here you can enjoy magnificently ample views of Hyde Park and central London skyline, including the City, the West End and the Palace of Westminster. We are able to arrange all the services that you would find both in a five star hotel and in a private home run by professional staff. Our concierge and client servicing team can arrange airport transfers, in-resort transport, vehicle rentals, child care, massage and beauty treatments, sport and leisure activities and reservations to ensure a memorable stay. Please let us know what your requirements are or call us for more information.